For awhile now, people in the know have been able to buy 6 of my photo cards for $15 (or buy-5-get-1-free). I've decided to make this deal generally available in my etsy shop. I spent a bit of time today putting together photo montages of all the different designs available. 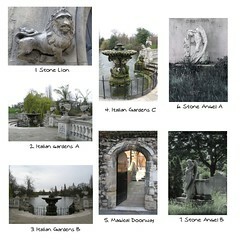 In addition to the stone & statue ones above, there's also cupcakes, and butterflies, and orchids, and other bits of nature. Mix and match and pick and choose! 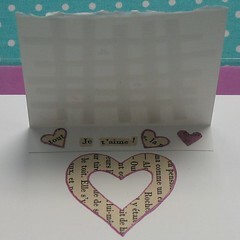 So here is the first card made with some inchies. As usual, the paper bits come from that tatty old copy of Jane Eyre that I've been chopping up for my collages. There's also some pencil crayon, water pencil crayon, watercolour, and ink. The middle square is based on a doodle in my sketchbook from more than a year ago. All my inchies are one-of-a-kind... I find that I keep having new ideas before I'm even finished with the current one. I might play with the same themes, but individually, they'll be unique. 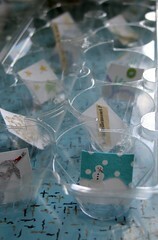 I've been working on little "inchies", which are inch-squared works of art. I will likely mount them in groupings on cards. For now, each is its own end. The snowman was one of the first that I finished. I don't know why, but I often catch myself singing Christmas carols in the summer for no apparent reason (on one notable occasion I was singing O Come All Ye Faithful in Latin in my husband's parent's kitchen in July!). I am loving that it's summer, but somehow, when I looked at the spotted blue fabric, I thought it looked like snow falling. 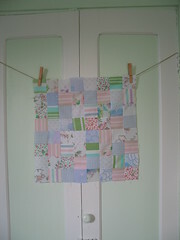 What do you do with a box of fabric scraps? In cutting out squares for my picnic quilt, I've been generating a lot of even smaller scraps of fabric. I thought I might play around with making a mini-quilt. In between seeing a number of Fringe shows, I cut out lots of little two-and-a-quarter inch squares. I wasn't sure if it was going to be card-sized, or napkin-sized, or the size of one my quilt back squares. It ended up being a bit smaller than the latter because my seams were a little bigger than 1/8", so I think I'll make it into a cushion cover. I will probably leave it hanging on the cupboard in my studio for a little longer though, because it makes me smile. If you click-through on the Pretty Thing photo, I've added notes for where I got some of the fabrics. The unlabelled patterns were all from my stash. Everything else I either found at a thrift store or it was given to me to use in the quilt. What have you made with scraps? Be they paper, yarn, fabric, or something else. I'd love to see how others are recycling their little bits and pieces. I've listed a couple new collage/mixed media cards in my etsy shop: a string girls one and a woven paper collage one. The latter was a bit of an experiment as a result of a mishap. I mucked up the alignment of my signature stamp on the back of a card, so it was essentially scrap. I started thinking about how I could use part of it to make a fun flap-door on a card. From there, I was thinking of hidden meanings, and the phrase "read between the lines" popped into my head. 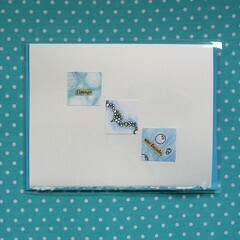 You can see the front of the card in my Papery set at flickr or click through on the etsy listing. I've been a bit on hiatus from even thinking about my blog as I had a friend visiting. It's always fun to play tourist in your own city since in our day-to-day lives we often miss the things that visitors go home to rave about. The Archaeology museum, the château Ramezay museum, the Biodome, and Olive + Gourmando were some new things. Picnics, artisinal ice cream, the Jean-Talon market, and the botanical gardens were some old favourites. 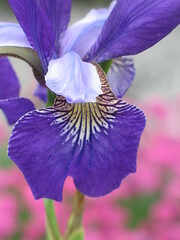 This pretty iris with the pink of some other flowers in the background might make its way onto a card. (See more of my photos from this and other visits in my botanical gardens set.) If you are in Montreal, now is the time to see the alpine garden. When I was a kid, I always had my nose in a book. As a teenager, I devoured shelves of YA fantasy. My favourite author was, and still is, Diana Wynne Jones. In university, I borrowed my roommate's extensive collection of Terry Pratchett novels (all that had been published up to that point) for escapist reading during exam time (the more stressed I got, the more Discworld books that I read). Now, a lot of my time seeps away to reading blogs and doing other things on my computer and I don't read as much as I used to. Every now and then, I still go on reading binges where I stay up late to finish reading "just the next chapter". But I have also been known to stretch out for weeks slowly limping through a book that I'm just not that into. I have trouble NOT finishing a book. It's like I want to give it the benefit of the doubt until the very end. Or sometimes that I am curious about the story, even if I don't like it that much. This is happening to me currently with Catcher in the Rye. I never had to read it in school and I hear so many pop-culture references to it that I wanted to read it and understand. All I've gotten so far is a bit confused as to why it ended up as a "school book". I find the main character whiny and annoyingly immature and I loathe the writing style. Maybe I missed the age-window where I would have liked it, but I doubt it. It's become my "waiting room" book. I read it when I am essentially a captive audience and have nothing better to do. I can't wait to finish it and get on with some of the other "I should have read this" books on my shelf like 1984, Wuthering Heights, Dune, and Pride and Prejudice. I sure hope that I enjoy some of them more than this one. You can see what I've read so far this year at my LibraryThing account. On this note, I've posted a new poll asking about what you like to read. You can find it in the sidebar as always. I'm definitely more a fiction gal than non-fiction. Fiction (particularly fantasy) captures and inspires my imagination in a way that non-fiction doesn't usually. 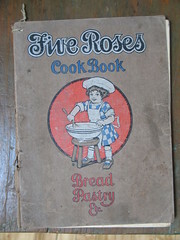 My non-fiction books mainly fall into two categories: food/cooking and art. Post a comment if you have a favourite author that you'd like to share.